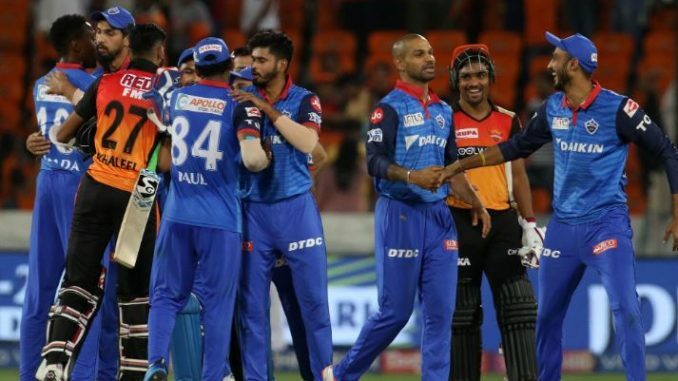 Delhi Capitals defeated Sunrisers Hyderabad by 39 runs at the Rajiv Gandhi International Stadium in Hyderabad on Sunday. Capitals’ Keemo Paul bundled off the top order, Rabada and Morris triggered mayhem in the middle and lower order. While chasing, Sunrisers were 101 for 3 in 15.2 overs when Ricky Bhui fell to Paul but after that they lost seven wickets for the addition of just 15 runs. Morris picked up three wickets in the space of five balls in the 18th over. Soon the home crowd saw their home team ending their fight in 18.5 overs, after being dismissed at 116. David Warner, who top-scored with a 47-ball 51, was out there until the 17th over. After this win, Delhi Capitals ended at the second spot on the points table, while SRH slipped to the 6th spot. While batting first, Delhi Capitals skipper Shreyas Iyer top scored with a 40 ball 45 and his 56 run partnership with Pant for the fourth wicket took them a challenging total. Colin Munro was the other notable contributor with a 24-ball 40. DC openers, Dhawan and Shaw struggled, both ended in the dressing room by the 4th over. Sunrisers restricted Delhi Capitals to 155 for 7 after the visitors were invited to bat. During the chase, openers Warner and Jonny Bairstowmade a watchful start as they looked for accumulating runs without taking risks. At the 10th over, Sunrisers were 73 for 1 with 83 more runs needed for a win. With back to back wickets falling, Warner couldn’t do much to for Sunrisers Hyderabad to inch close to the target.